Today my son had his kindergarten orientation in the morning, so I decided to burn a whole day at work for it since Mondays are pretty slow. I figured I would hit the range for an afternoon of fun with some pistols I’ve never shot. 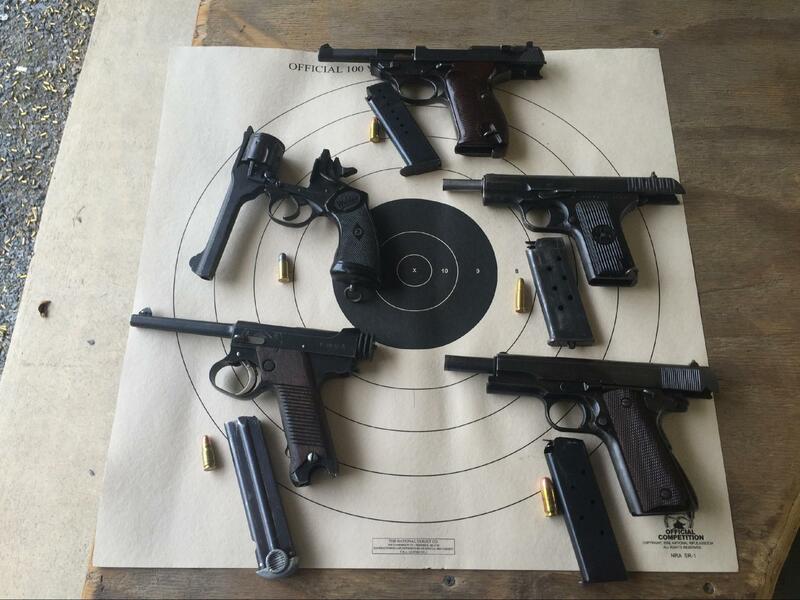 I filled up my pistol case with the main sidearms of the “Big 5” of WWII and head to the range. First up was my Ithaca 1911. This is one of my favorites to look at. These old 1911A1s are very pleasing to look at. I love the look of the worn parkerization, which leads you to believe that it must have one heck of a story to tell. I’ve never shot this one before today, even though I packed it along to the range many times. 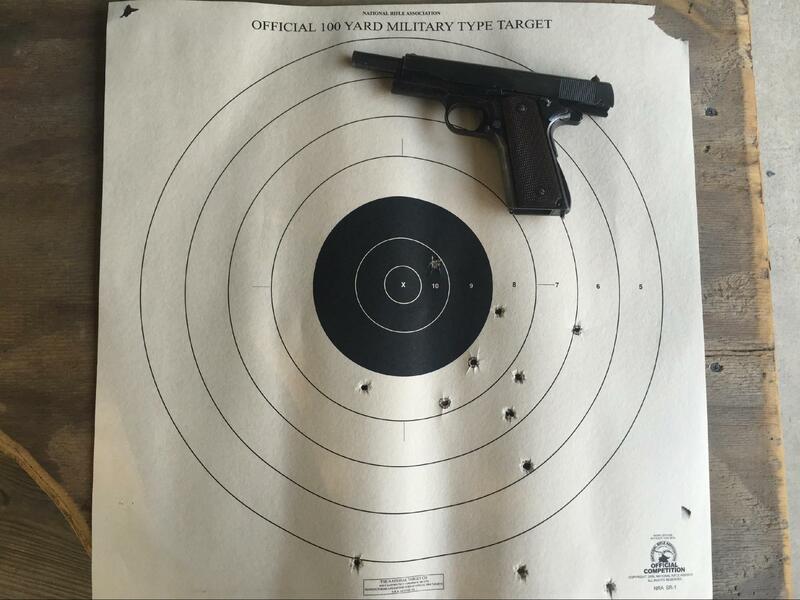 As you could imagine, it shot like pretty much every other 1911A1. Not very well for me. The trigger was decent, albeit heavy. I somehow developed a flinch that didn’t help my pistol shooting much. 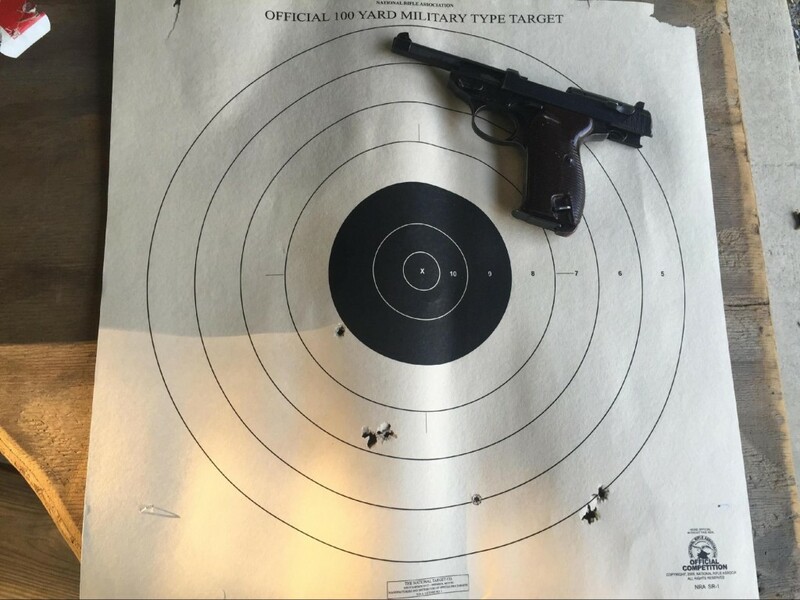 Although I’m sure it also did not help that this is the first time I’d shot a handgun in months, since I’ve taken up shooting High Power competitions, more seriously. So to sum up this one, good shooter and probably my favorite of the day. Next up was one I was a little nervous to shoot. One, because of a lack of available parts, and the fact this is an all matching gun, complete with capture papers, but also because I was about to shoot some 8MM Nambu ammo manufactured from 40S&W brass made by Buffalo Arms. The ammo functioned fine though! I recommend it for a cheap source of a nearly impossible caliber to find. If you still didn’t figure it out, it is a Nambu, Type 14, from Japan. This gun had a very light trigger with a lot of creep. The first shot surprised me a little, as I thought I was still staging the trigger. The trigger also seemed a little finicky, with reset. 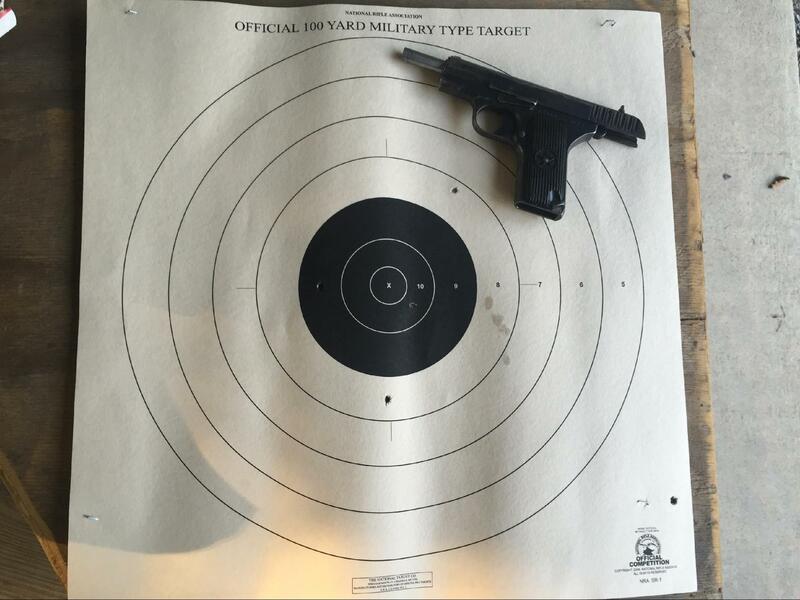 Accuracy didn’t seem horrible, but again, I never shot this gun and that trigger will take some getting used to. A fun one to shoot, but nerve-wracking due to the aforementioned reasons. After the Nambu was one of the main sidearms of the British Empire. 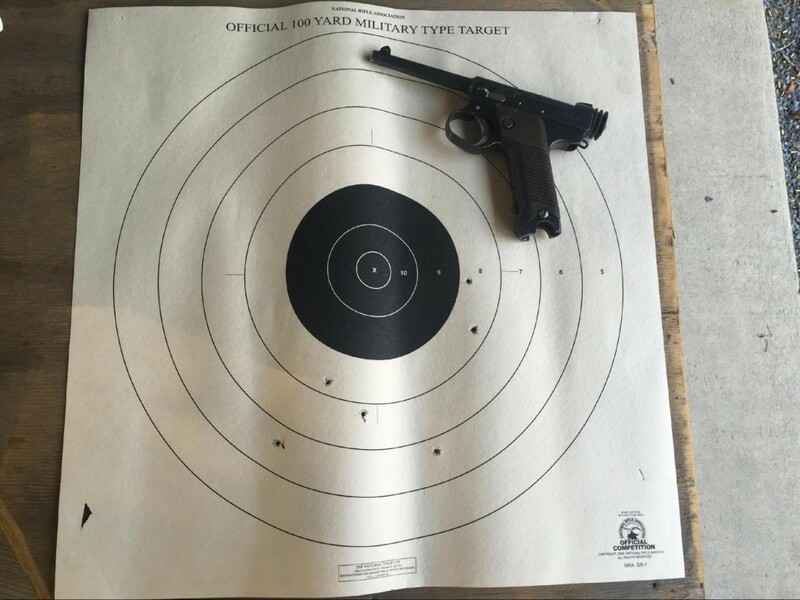 The , firing the anemic 38S&W. Another one that I bought for the collection, and never fired. I had only read stories of the Limeys hate for 38S&W cartridge. After today, I see why. 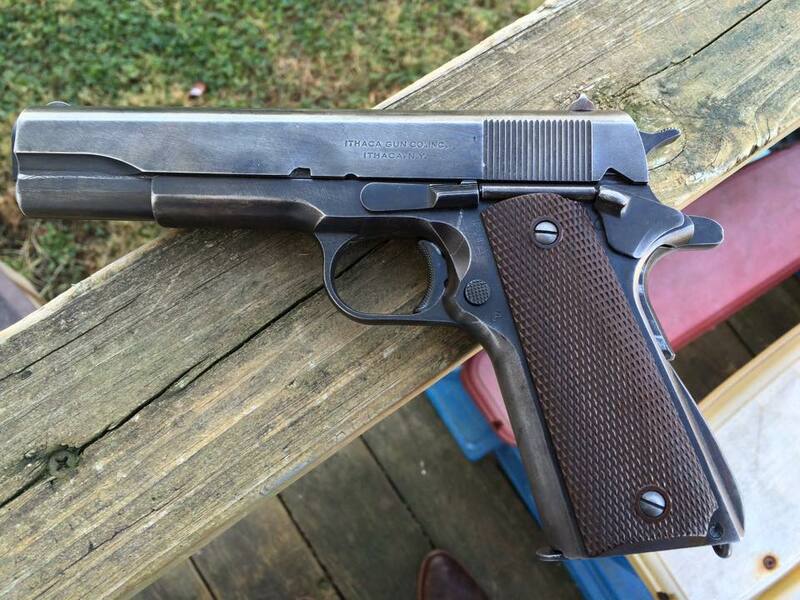 After firing a 1911 and even the Type 14, this thing felt like a cap gun. I’m pretty sure Jerry could have just reached up, caught these .38 bullets and threw them right back at the Brits! Despite the lack of power, this was still a blast to shoot. Breaking the top, flinging the casings proved to be almost as much fun as shooting it. This one shot extremely low. I think the bullet may have been close to dropping out of the air on its travels, all the way out to the target, 25 yards away. Now, I decided it was time to shoot one with a little more heat. So next, we traveled to Mother Russia and picked up a TT-33. While I never shot this one, I’ve fired other Tokarevs, and they all felt like communist garbage, to me. Trigger slap, pins walking out rickety slides. Just plain junk. Well, the 1939 Soviets must put a little more care into their pistols than they did in later years. This example was very nice to shoot. The trigger was not just adequate for a service pistol, but pretty nice, and it did not feel clunky at all. Very tight, and I think shoots nicer than I did today, with my case of the shakes and fatigue. As I’m sure many of you that have shot the 7.62×25 cartridge before, know, that it’s no slouch. It’s a blast to shoot, no matter the clunky platform you’re using. And finally, to finish off the big 5, the main power of the Axis of Evil, Germany. I grabbed a P-38 to finish out todays shoot. It was a tough choice between this and the P08, as I didn’t want to drag even more guns out, just to clean when I get home. This was a close second, for my favorite of the day. I always love shooting P-38s. Great trigger, great ergonomics, usually accurate (just not today) and just very comfortable to shoot. Also, the cheapest to shoot, and buy, of the main WWII sidearms. This one has a neat story, but no papers to back it up. The guy I bought it from, picked it up at a pawn shop. They told him an old gentleman brought it in to trade it on a game system for his grandchildren! Normally I would frown upon this, but it was assumed that this was his trophy from Germany, so who would I be to frown upon him trading it off for a game system? It came wrapped in a Nazi podium flag, and stuffed in a P-38 holster, just as he brought it in to the shop. I like to think it was true, so I kept the whole grouping together, as it would be a shame to break it up, if it is indeed true. So to sum it up, it was a great, lighthearted afternoon at the range. You don’t always have to head out to test a load work up, or work on your offhand position. 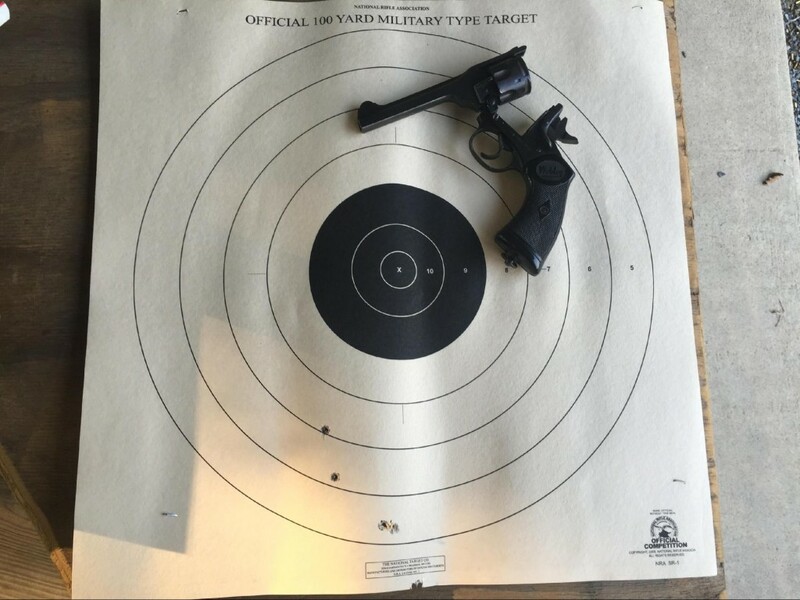 Sometimes its nice to dust off the old war horses and have some fun sending a few rounds down range. Just remember, do a little research and use the proper ammo. A lot of these military surplus guns were designed for very specific bullet weights, such as the P-38, which you could easily destroy by cracking the slide, shooting anything +P, or a 147 grain bullet. Also, replace your 70+ year old springs! Springs are very cheap, and very vital to these old girls. Don’t let a weak $12 dollar recoil spring destroy your valuable, matching pistol!